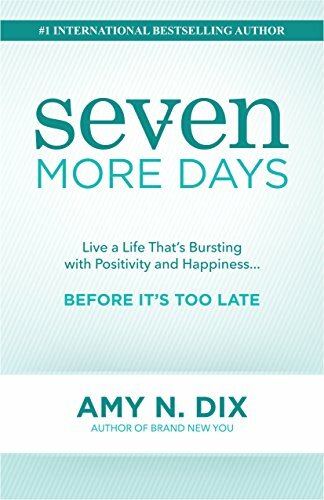 Best Seller Publishing announces the release of Amy Dix’s new book, “Seven More Days: Live a Life That’s Bursting with Positivity and Happiness … Before It’s Too Late.” It will be available for free download in the Amazon Kindle Store for one more day on August 10th. A story told through true life events, “Seven More Days” reveals the essence of death so you can enjoy the eminence of life. From six simple words of woman on her deathbed, “I am not afraid to die”, comes a story that captures the true meaning of happiness and challenges the chaos in today’s world…leaving you to question your past actions, yet changing them for the future. This book gives you processes you can implement in your life to mold it into exactly what you want while building your character, connections, and community. “Seven More Days” creates a gripping experience of emotion, hope, and change within yourself. Through science, you will understand how the human brain processes information, experiences, and emotions. Once you understand the how, you can move forward with the greatest of ease towards a life that is bursting with positivity and happiness…before it’s too late! “Seven More Days” by Amy Dix will be free and available for download on Amazon for 1 more day (08/10/2018) at: https://www.amazon.com/dp/B07D4533YW. “Before I even started reading ‘Seven More Days,’ I knew I was in for a heart wrenching journey. ‘Seven More Days’ is the story of a loving family dealing with the imminent death of their Matriarch. How do you cope with seven more days? This book is so much more than one family’s saga. It is a life lesson for us all. It is a helpful guide that teaches us the real meaning of happiness and simple realistic tips on how to get there. The segment - I Love L.U.C.Y completely resonated with me (without consciously realizing it) this has been my mantra. Amy Dix, an International Speaker, No. 1 International Best-Selling Author, and Positive Psychology Practitioner inspires others to live life on a different level, rooted in positivity and pure happiness. After her mother was diagnosed with terminal brain cancer, what transpired next left others in awe, moved, and in search of how they too can live a life of positivity. This single journey led Amy to study positivity and the impact it has on your life. Amy co-founded The Positive Life Company to bring the science and research behind happiness and show others how they can achieve anything that they want to achieve in life…before it’s too late.